The Sumo Collection is defined by its simple yet powerful lines sculpted with a well proportioned stainless steel base and legs that are matched to thick and wide pieces of teak. The Sumo Square Table a perfectly sized table for seating 2-4 people. 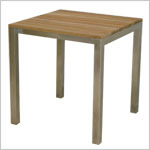 With its beautifully finished teak table top and stainless steel base, it is suitable for use indoors as well as outdoors. These expertly crafted tables are fully welded and assembled. Matches with the Sumo Stool, Sumo Chair, or Sumo Arm Chair.